Attention Texas teachers! Use this easy to prepare resource to post your daily or weekly TEKS and help students take ownership in their learning! This set is current for the 2019-2020 school year. The Texas Essential Knowledge and Skills (TEKS) are the state curriculum standards. There standards for each grade level and subject available through the Texas Education Agency website. What is on each standards card? The upper left-hand side of the card notes the strand (ex. K.1). The standard is written in a kid-friendly statement when possible. There is also a graphic to represent each standard. 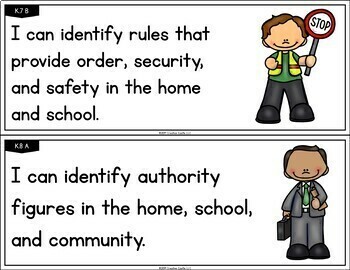 If there is not a suitable graphic to depict the standard, a graphic of a child is there instead. What does “implemented [year]” on the cover of the individual subject TEKS packs mean? The TEKS go through a process of review, adoption, and implementation. The year they are implemented is the first year they are used in classrooms. The following dates are projected and NOT guaranteed. These dates are based off the Proposed TEKS Review and Adoption Schedule and are subject to change. 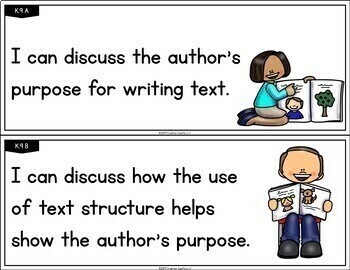 How are the standards phrased in this resource? How can I utilize this resource in my classroom? 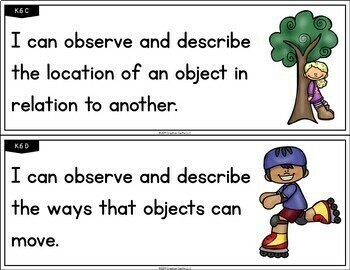 Use these objective cards in your classroom to help set daily or weekly goals. 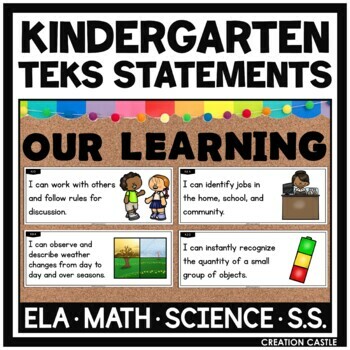 Post the TEKS in your room and recite the statements to help students take ownership of their daily learning. How big are the TEKS statements? There are two standards provided on each page – every individual standard is 4.25 x 11 inches. Do you provide the TEKS statements as full pages? No, the standards are only provided as half pages. Will the design of these cards change when they are updated? It is possible the design will change. This resource has been offered for many years and gone through many changes. The design may change over time, but the cards with always be half a page and include the strand, kid-friendly statements, and a picture. Why are updates necessary for this resource? The state of Texas is constantly evaluating and re-writing the state standards to make sure we are providing the best education to our students. There are committees that work on revising the TEKS. There are many stages to getting a new set of standards ending with the implementation of the standards in all classrooms. This resource used to come with a color background. Why isn’t this an option anymore? To make this resource as versatile as possible, the background colors have been removed. However, colors are available upon request at no additional charge. For more information, look at the order form in your download. My school requires specific language or phrasing of the TEKS. Can you send me an editable version of this resource? No. Due to copyright terms of the graphics used, this resource is not editable. If you need an editable version, you can find that here. Please note the editable TEKS sets do not have guaranteed updates.